The DKN vinyl kettlebell has a strong moulded construction that ensures safe and effective workouts. This heavy kettlebell weighs 20kg (44lbs) and can be used by those who want to seriously focus on developing functional strength, endurance and core stability whilst toning their muscles at the same time. An anti-slip base of the kettlebell makes exercising much safer, whereas an ergonomically designed handle improves comfort and provides an easy grip. The kettlebell is supplied with a detailed chart showing how to work out with it. for submitting product information about DKN 20kg Vinyl Kettlebell We aim to answer all questions within 2-3 days. 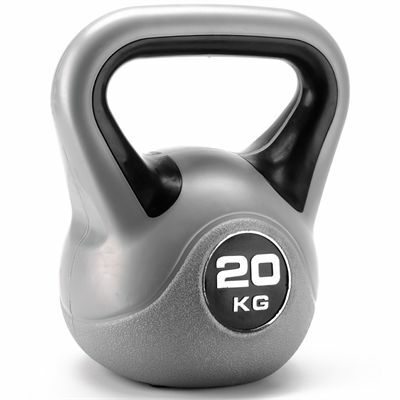 for submitting product information about DKN 20kg Vinyl Kettlebell. We aim to answer all questions within 2-3 days. If you provided your name and email address, we will email you as soon as the answer is published. for submitting product review about DKN 20kg Vinyl Kettlebell.